With good landscaping and gardening, you have your own private retreat in your backyard. 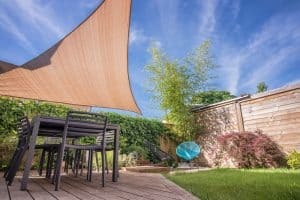 No matter the size of your garden, with a little creativity and smart choices you can make your backyard a place to relax, entertain or play in. Careful designing is the best way to create an outdoor haven in your backyard. While it’s fine to work on one area of your garden at a time, especially if you are doing it yourself, it’s important to have the ‘big picture’ dream in mind. Get out that scrapbook, head out to your garden and sketch out your garden fantasy. Bring in a landscaper who will be able to discuss your options and offer you more ideas in terms of materials, budget and more. An outdoor haven is nothing without magnificent grass to accompany it. Digging up and preparing your soil for turf laying can be inconvenient, and definitely not something you want to do often. Use the fact that you are renovating the space to choose the perfect turf for you. Your turf supplier will be able to help you choose the best turf type for your Sydney home. Tempted to get fake turf? Before you do, consider the negatives of fake turf such as the chemicals it can leech into soil, the heat it retains as opposed to the cooling effect of natural turf, the aesthetics, and the build-up of dirt and debris that can often occur. Real green, beautiful grass, is far more appealing. Outdoor décor is booming these days and you can pretty much create your garden in any style you like. Match your inside theme with your outside theme or make it completely different. From oriental gardens to provincial themed sanctuaries, with the right styled pots, plants and outdoor furniture, you’ll have a beautiful themed space to relax in. Depending on your tastes, there are some fantastic ways to bring cooking to the outdoor space of your home. From your standard BBQ, to wood fire pizza ovens and smokers, you can create an atmosphere that includes good food, good music and a great space to lay on the grass, without needing to leave your house. Since 1974, Hi Quality Turf has offered a wide range of popular residential and commercial turf varieties to homes and businesses such as Buffalo Grass, Couch Lawn, Empire Zoysia, Kings Pride Buffalo, Palmetto, Sapphire Turf and Kikuyu. We understand how important beautiful green grass is to your outdoor space, and we’re happy to provide you with great advice on which turf will suit your needs. We deliver turf supplies within Sydney, Wollongong, Newcastle and the Central Coast. Contact us today on (02) 45 723 666 to begin work on your outdoor haven.